A pair of rare, highly-endangered Whooping Cranes has been seen in the north Texas area. They’re at the 11,300-acre Hagerman National Wildlife Refuge about 35 miles north of Denton, and east of Gainesville. Experts think they will, after resting up, continue to their winter home at Aransas Wildlife Refuge in south Texas. 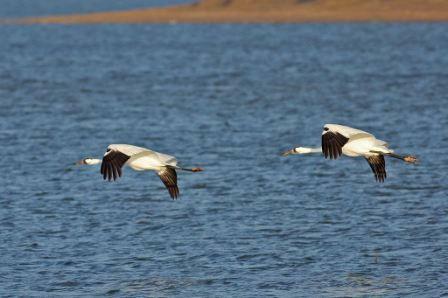 Whooping Cranes are a large, very rare, bird species, protected under the Endangered Species Act. These birds are most likely migrating from their summer breeding grounds in southern Canada. The number of Whooping Cranes in Texas is at a record level. In a recent census of the Aransas Refuge and surrounding areas, the total number was 260. The pair resting at Hagerman, which will continue migrating, will add to that number. Although still quite rare, at one time the Whooping Crane was near extinction.